The village councillors hosting the prize giving. 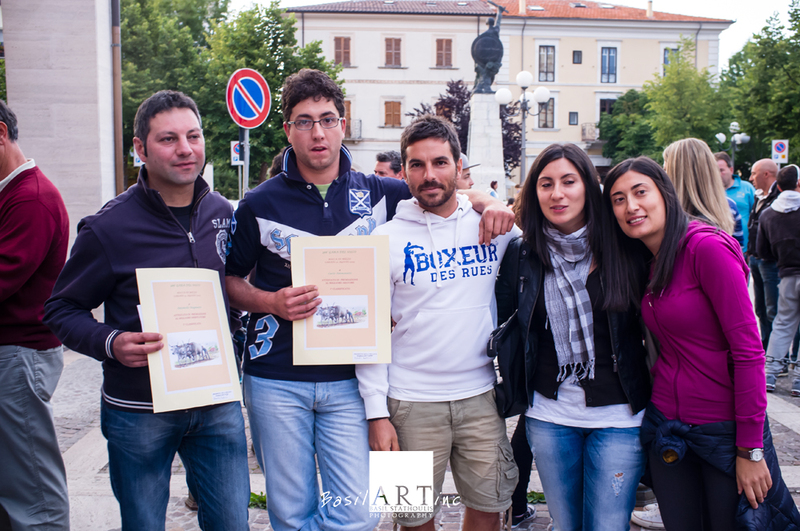 The prize giving was held in the courtyard in front of the oratorio at 7 p.m. that evening. A small tired crowd gathered. The municipal council members stood on the steps leading to the “Proloco”, the municipal offices. The councilors made a speech about the importance of maintaining the tradition, and how important it was not to use modern aids like cellular phones and lasers. No doubt satellite navigation can help too. Even the new powerful light concentrating LED lens torches make a huge difference. Don Vincenzo offered a prayer to the Good Lady and then the runners up were announced. The team that won had only six members. Incredible. And they were indeed the second from the Rocca di Cambio. No political decisions this time! With the late night behind us and a long baptism lunch just over nobody stayed to celebrate. The winners received a certificate and the floating trophy. The winning team with certificates. 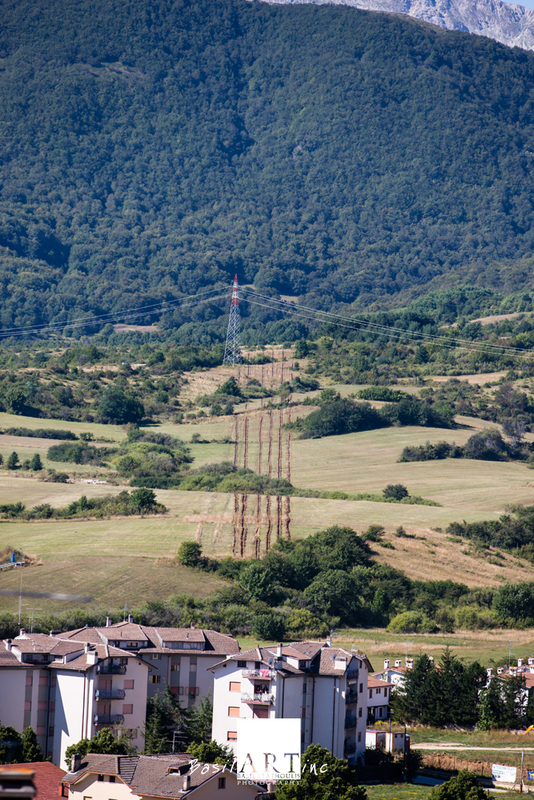 The Gare del Solco is under threat. Although there is spirited group of passionate young people in the village, some of whom return from the surrounding cities to do the ploughing, the village is small with only eight hundred full time inhabitants. The sections to be ploughed have been shortened as some areas are now within the park boundaries. It is threatened by the use of technology to the point that it may just become a virtual exercise. Lastly, and most incredibly, it is an undertaking that would never pass industrial safety standards anywhere. Using tractors around untrained people, some of who are drinking good wine is a crazy idea. Even more dangerous at night. Worse still in dry fields with open candles and gas lanterns on unsteady tripods being carried over rough ground. According to verbal records nobody has been injured yet in the Gare del Solco other than the obvious tiredness mixed with hangovers I saw the next day. It will be wonderful to go retro and do it with cattle drawn ploughs and candle light. The only modern concession I would allow is for women to participate. I hope they continue the tradition. I wonder what modern plagues we may exorcise with this tradition? Looking from the bell tower the next day. The Gran Sasso D’Italia lies in the background. The Contraposta with village lights twinkling in the distance. 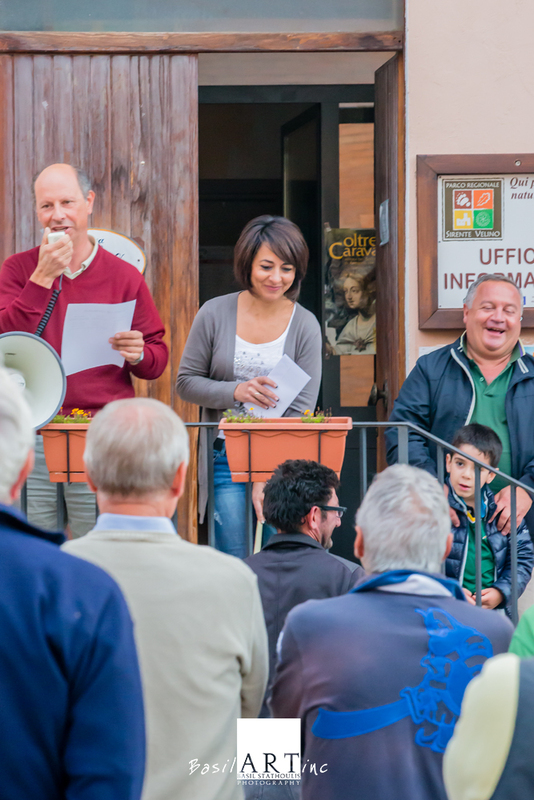 Before they leave the piazza in the afternoon the village and “squadra” gather in front of the Oratorio, the only remaining church for a village with three significant medieval churches, including Our Lady of the Snow. The 2009 earthquake had damaged all these beautiful churches. The “oratorio” is a modern hall converted to the village church for now until the main church is repaired. 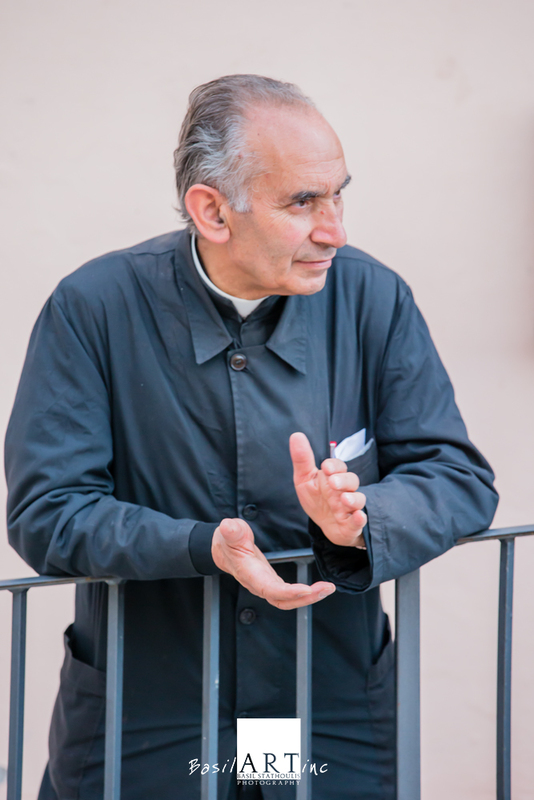 In the courtyard in front the village choir sang traditional songs, then the priest, Don Vincenzo, blessed the teams. Finally a young boy was called up to draw the order for the six teams starting from Rovere. Apparently the teams on either end are at an advantage. The lonely code of manning the contraposta in the cold and dark. 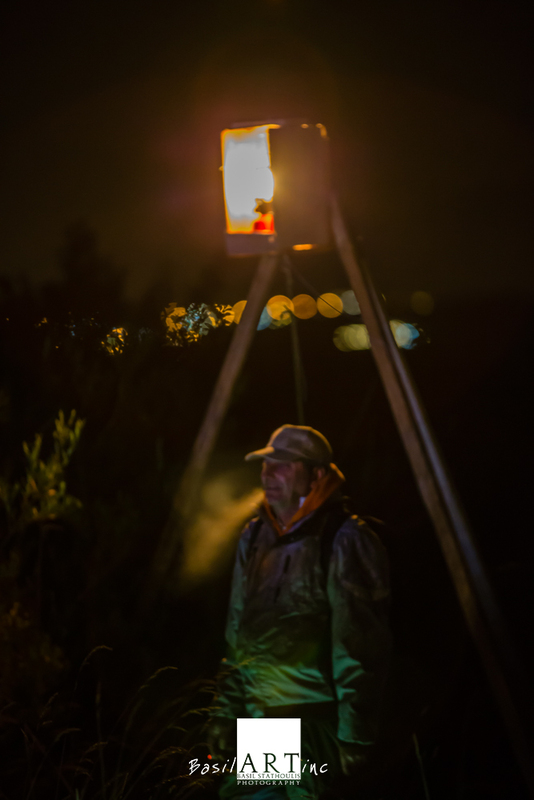 The teams make their way after the draw and have to wait in the fields in the dark for the light at the bell tower to be positioned. I went into the hills at 9 p.m. The one team had started and finished by 11 p.m. I am still not sure what the rush was but the leader is renowned for his love of alcohol and probably ran short, hence the rush. The team I followed, closest to Rocca di Cambio, took it easier. We all had some wine and a panino then they started to place the “contraposta”. As I walked in the dark with camera and tripod I realized there were the remains of the previous year’s “gare”, hard scars in slightly different alignment as the position of the main light changed. Also the line seemed to cut along the edge of some serious bush and trees. Later in the night I heard chainsaws and axes removing obstacles. 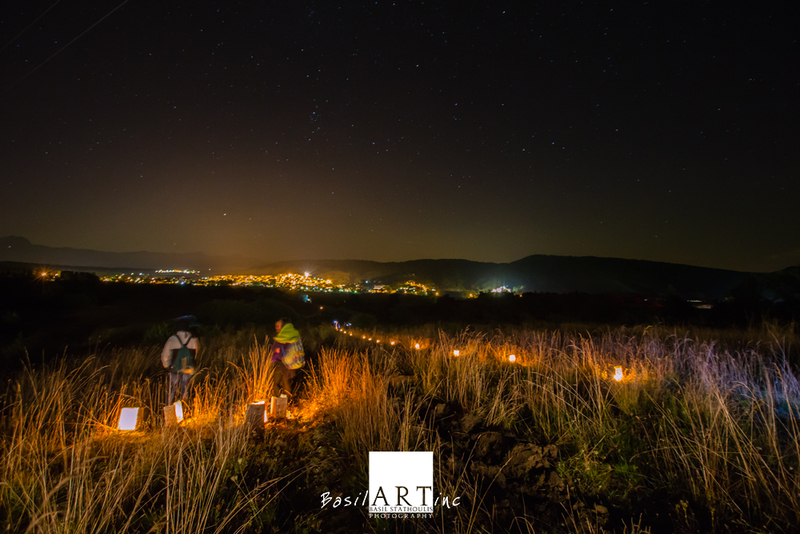 A line of lanterns leading a straight line to the village. The first section was a few hundred meters long. The second section was a bit under a kilometer, and the last section about the same as the first, and close to the village. 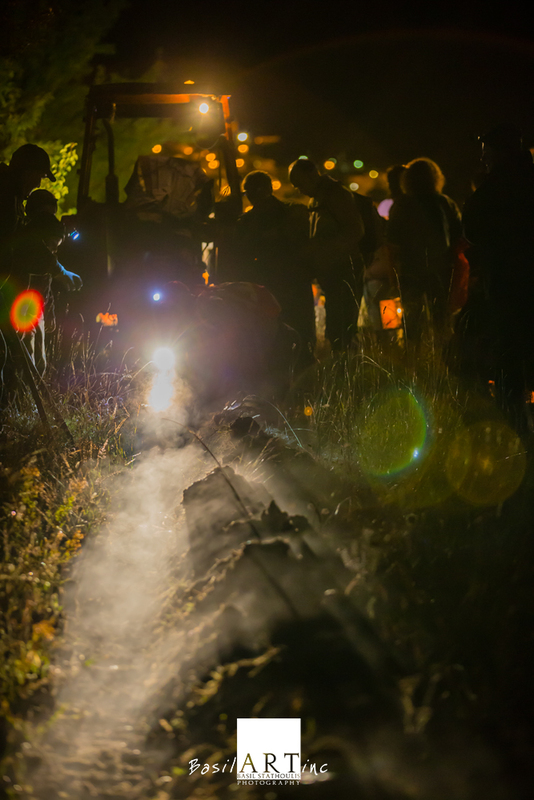 By the second section the team was well oiled and the laying of the light line of lanterns was much quicker and more accurate. As the tractor passed and the plough blade etched the hard earth, steam rose from the furrow. As the tractor passed the back end of the team refined the furrow for any minor deflections with hoes and spades by torchlight. 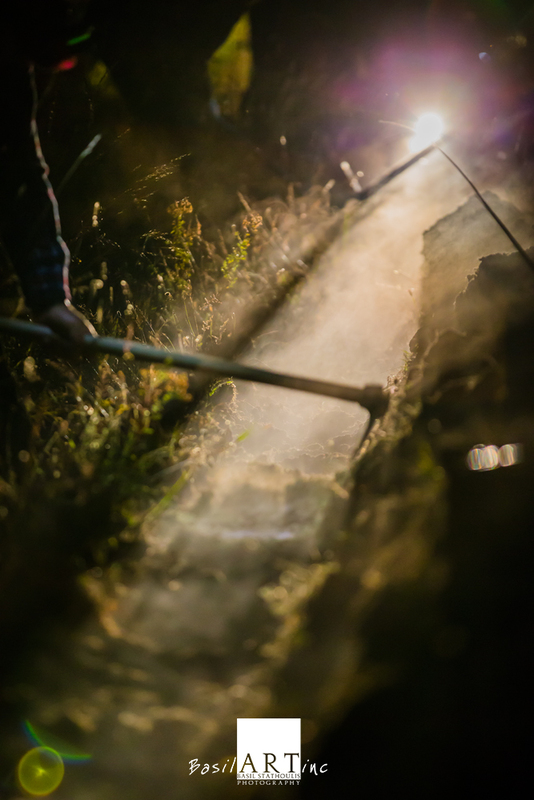 Finishing the furrow: steam rising from the cut soil. Finishing the furrow with hoes. The last team finished the last stretch at 5 a.m. the next day. One of the members, a cousin, took me to the bell tower before noon the next day. We were alone initially and I could only laugh at how skew the last section was for each tired and oiled group by the end of the evening. My cousin did offer the excuse of a big tree stump that blocked them halfway through the last section. The deviation was obvious! As we stood on the hill and took photos the villagers, spectators and members of the “squadra” arrived to inspect the furrows. Some even had binoculars and all offered an opinion of who the winner was. 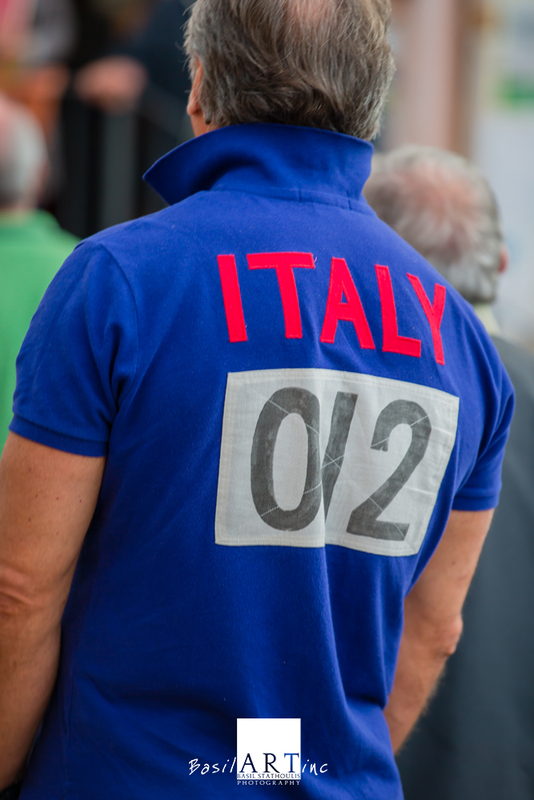 It was obvious that the squadra second from Rocca di Cambio was the best, but I was warned that sometimes “politics” changed the result of the judges. Rovere in the distance: rolling down the foot slopes of Sirente. 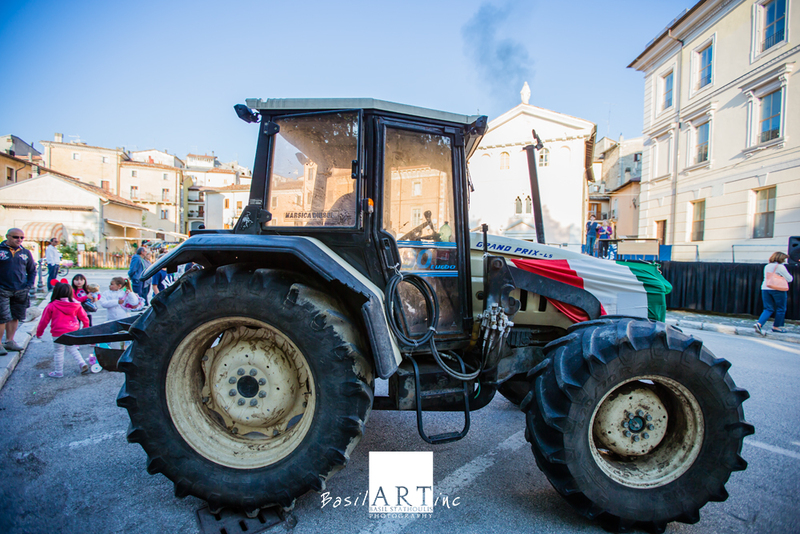 There is so much to say about this ploughing competition dating back to the times of medieval castles in Abruzzo, Central Italy. 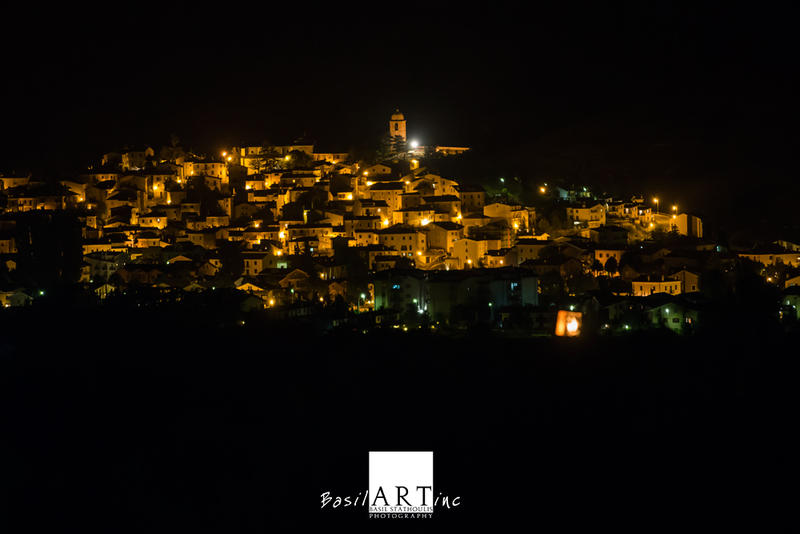 In 1625 the people of Rocca di Mezzo, a small village set on the plateau called the Altipiano delle Roche in the Parco Nazionale Sirente-Velino promised the Good Virgin to plough as straight as an arrow by night if She would rid them of the plague. I seem to think the tradition might even predate the Christian church, but that is just a thought. 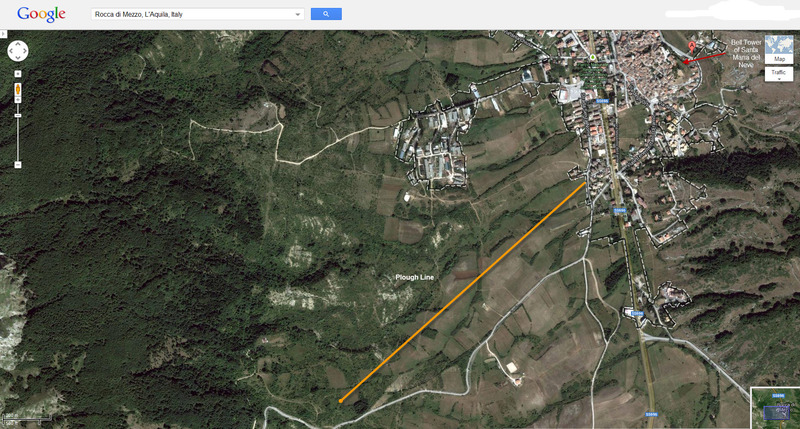 The plague passed from the village that year, and the “Gare del Solco”, the competition of straight furrows, was born. There are two other villages that have the same tradition but run the competition during the day. 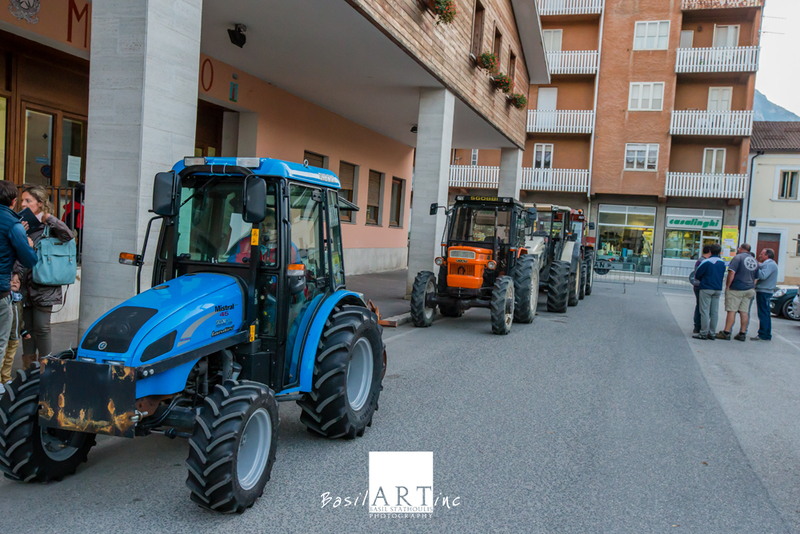 In Castel Morrone in Campania and Valentano in Lazio the competition lasts two days and the teams plough in a radial fashion towards a central church. The church of the Good Virgin, “Santa Maria del Neve”, Our Lady of the Snows, crests the hill on which Rocca di Mezzo lies at 1350 meters above sea level. It has been closed since the great earthquake of 2009, but is under repair. 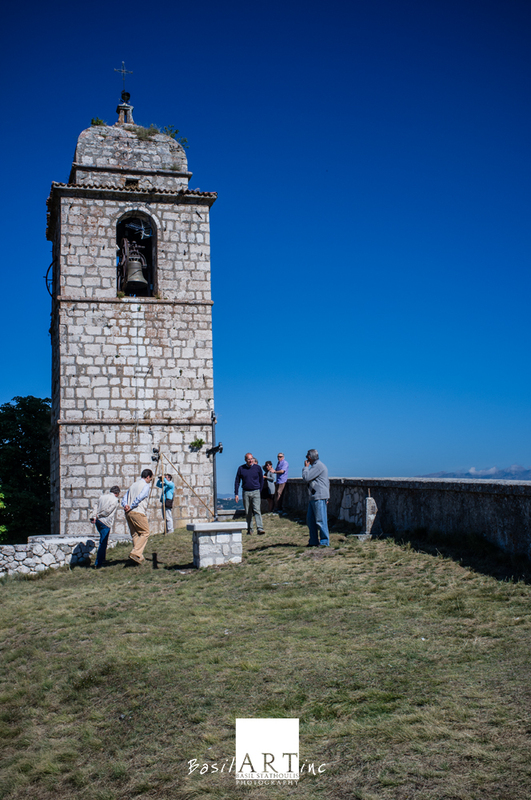 The medieval bell tower stands south of the church, facing the long crest of the Sirente Mountain. Before tourism overtook agriculture as the greater source of income for the village, a candle would be placed on a wooden tripod near the bell tower as the central point to aim for while ploughing at night. Even as late as the fifties they used only candles to align their furrows and cows to pull the wooden frame holding the man-made steel plough blade. It goes without saying that in those days there were only men doing the ploughing in October after harvest. In some ways the ploughing was easier then as the fields had been worked for wheat and the soil was soft. Needless to say there was food and wine consumed, much as there is today. The village moved the Gare to the end of August, so the tourists could experience it as well in the high season. Also, now the fields lay unploughed and the soil is hard and tractors are used to pull the plough. Even woman and children participate, with tourists winding their way between the teams. At its peak there were eighteen teams ploughing over 3 kilometers, from the base of Monte Rotondo to close to the village. This year there were six teams, better than the four of last year. Now the distance is less as well. It is not that they plough in a continuous fashion. For the judges the next day who stand under the wooden tripod (the “punto di riferimento”) on the hill next to the bell tower, in fact, the furrows do seem continuous. But in the field they only plough the slopes that face the bell tower, and the art is to make the intervals appear non existent so that the furrow does indeed seem continuous from the bell tower. The view from the village church: Monto Rotondo behind and right and the six furrows of 2013 clearly evident. 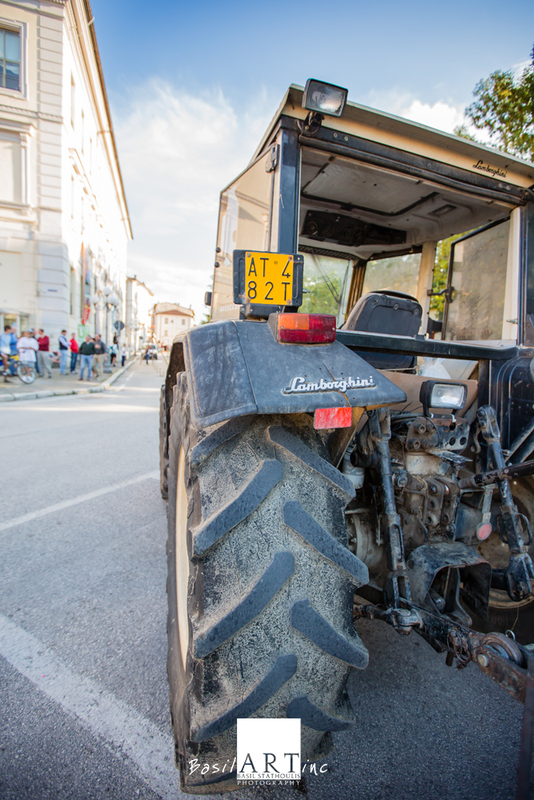 On the afternoon of the competition the teams gather in the piazza of Rocca di Mezzo and put on a demonstration on the road in front of the old school, with a single tractor, worn from work but the bonnet draped proudly with the Italian flag. The demonstration model was a Lamborghini, the genuine machine. The old man started out making tractors and in the fifties when he bought a Ferrari and went to Enzo to suggest some improvements, he was rebuffed. He decided to match it with a supercar of his own, named initially after the size of the engine but later after victorious bulls from the coredas in Spain. The tractors remain nameless, unlike the legendary Muira and Countach. 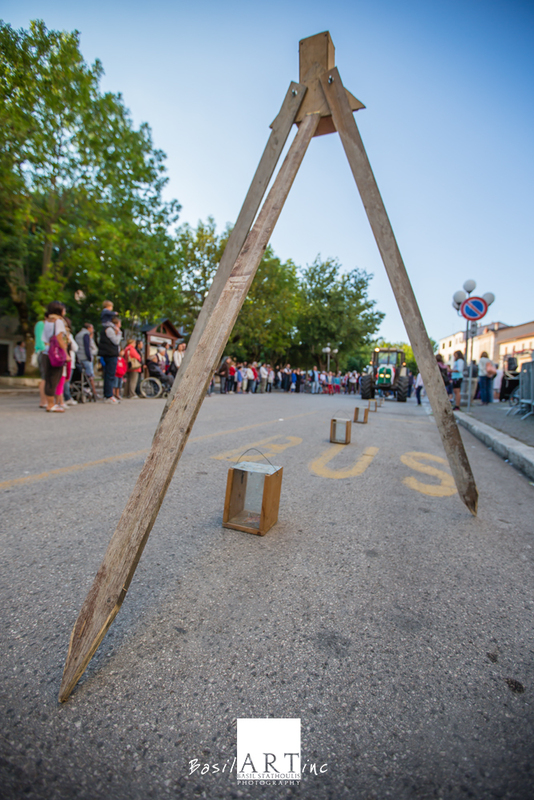 The demonstration in the piazza is accompanied by commentary on the history and technique of the competition, given by a group of young people on a stage that is used for all the summer village functions. Instead of ploughing up the tarmac they have a big funnel on the back of the tractor that drops a line of sand onto the tarmac. First the “surveyor” of the “squadra” (the team) lines up a plumb line from the start point. The he instructs the members to place the “contraposta” lined up on the crest of the next slope. This is a wooden tripod with a lantern burning brightly. The instructions are shouted across the distance, sometimes relayed by team members, and are very specific to the anatomy of the geography. No left or right, nor east or west, but rather “a Rovere”, the village to the right, or “a Rocca di Cambio”, the village to the left. Shouting “un pelo a Rovere” to move the “contraposta”. Shouting “unpelino”, a hair’s breadth, does the fine-tuning either way. When the controposta is finally in place, they shout “va beneeee” it’s OK. The chap who man’s the “contraposta” has to move only every time a slope has been ploughed. He is well supplied with good wine or grappa or rattafia, and on the longer stretches may even light a small fire. The temperatures can drop to 5 Degrees Celsius or less even at the end of summer! `The controller of the “contraposta” also has a specific code name for the night, so that his team can communicated only with him, as the teams plough only a few meters apart. Once the “contraposta” is in place then the members place “lantern” housing candles at intervals of ten meters between the start point (at the plumb line) and the “contraposta”. 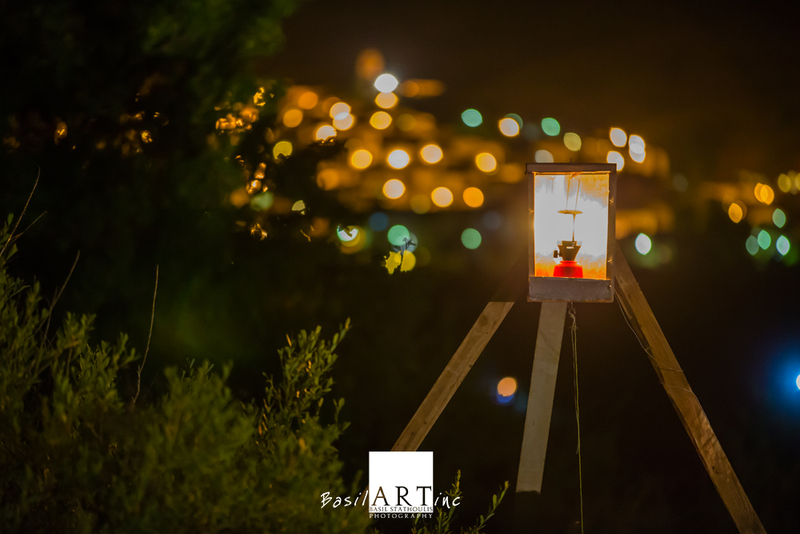 Each wooden box with glass front housing the candle is placed with the same shouting with respect to the neighbouring villages. Then the tractor follows the short line between lanterns and ploughs the furrow. Easy in the day time and on a short flat stretch of 50 meters on the village main road dropping sand onto the tar; very different at night in the wild!